The NAA Award categories are Trade Award (sponsored by Morson), NAA Innovation Award (sponsored by Jaguar Land Rover), Logistics Excellence Award (sponsored by DHL), Marketing Excellence Award (sponsored by GEFCO), People & Skills Award (sponsored by SMMT Industry Forum), Manufacturing Excellence (sponsored by Klarius Products), and the LJMU LCR 4.0 Award. 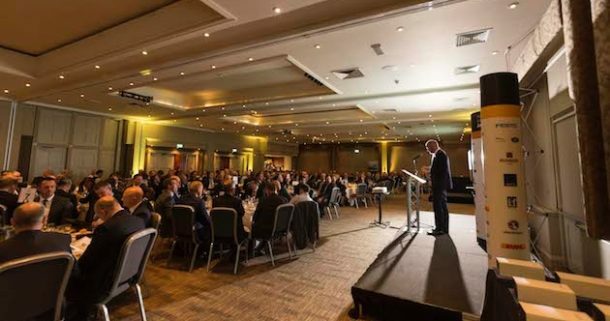 You can view more information about the Awards and download the application form here: http://northernautoalliance.com/about/naa-awards/2018-awards-application-information/. Please speak to us now about applying, as we can provide you with advice and support with your application. This year our Master of Ceremonies is Robert Llewellyn, who is perhaps best known as an actor, playing Kryten in Red Dwarf, as well as presenting programmes such as Scrapheap Challenge. However Robert has also gained millions of views over the last few years for his own YouTube series, Fully Charged, in which he focuses on the subjects of electric cars and renewable energy. With Robert as the MC, and also delivering the evening’s talk, an entertaining event is guaranteed, so as well as entering for an Award, please book your tables now whilst there is still availability. Other items in this newsletter that you should take a look at include the review of the CAV Conference held in Manchester, and our forthcoming events: the visit to RS Clare, and the rearranged Deep Dive workshop on Manual Handling at Pirelli. I would also encourage you to read the member articles and especially the new member articles from Senseye and The University of Warwick, and contact them if you are interested in understanding more about what they can offer – or take a look at their page on our website or speak to an NAA staff member. The North seems to be hosting more events; the UK Low Carbon Economy Summit will be taking place on 9 & 10 October at the Marriott & Albert Hotel Manchester and we have access to a number of complimentary passes. The UK Low Carbon Economy Summit will determine strategies for establishing a high growth low carbon economy through the transport and energy intensive industries in line with the UK Government’s Clean Growth Strategy. Bringing together low carbon policy makers, industry and innovators, the two-day summit will address approaches for improving efficiency across business, industry & transport, and enabling the shift towards a low carbon economy. If this is of interest then please email me before the end of August. Finally, after two and a half months with the BMW i3, I can now report that I have taken the car away from home for an 8 day period, which included over 500 miles of driving and no issues with charging and almost no use of the range extender. In fact, we were very pleased with how it linked into 8 days of assorted activity, the minimal cost of charging, the ease of parking and the manoeuvrability around towns with its excellent turning circle. Recent visitors who we transported from the railway station were also very impressed with its acceleration! Hopefully I’ll see you at LCV2018, where you can drive an i3 or an i8, along with electric cars – and vans, trucks and buses – from many other manufacturers!